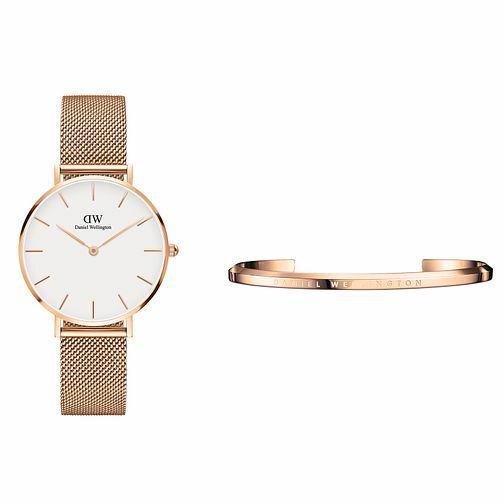 Sleek and sophisticated, this ladies' Daniel Wellington watch giftset presents a pure white dial housed within a rose gold plated case, with two co-ordinating rose gold tone hands, slimline indices and upon a chic rose gold tone mesh bracelet. An elegant and minimalistic rose gold plated cuff bracelet also features in this set, an understated accessory perfect for complimenting any outfit, day or evening. The presentation box is finished with a burgundy bow, ready and waiting to treat a stylish lady to.